Remember the feel of the day when academic results were announced? When you as a student were in a frenzy making big life decisions. Now reminiscing of the D-day when your results were declared decades ago, and you probably dreaded it to the core. But little did you know in life, you wouldn’t be judged merely on academic scores, and there was much more coming. You might have thought: there won’t be an exam, test, or critical evaluation in life any longer. But you would agree now that, life has always been full of critical evaluation, tests, and scores. You are constantly being judged on many levels by some scorecard or the other. One such scorecard is your ‘Credit Report’ or your ‘Credit Score’. → What is a Credit Score? A Credit Score is assigned to you by a credit information companies such as CIBIL, Equifax, HighMark. This credit score in turn is accessed by your prospective lenders. It is considered as one of the most important deciding factors by the bankers and lenders. This is because, a Credit Score will tell you and your lender how good or bad a borrower you have been. Higher your credit score, the better a borrower you are. This means that you probably make your payments on time. Hence lenders that lend to you face a lower risk that you will default. And vice versa - the lower your credit score, the higher the risk that you will default. → What is a CIBIL Score? 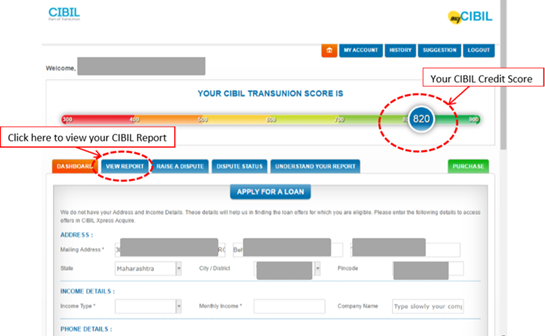 CIBIL score is a credit score generated by TransUnion CIBIL Limited (Formerly: Credit Information Bureau (India) Limited). CIBIL as is commonly known is a is an independent credit information agency. CIBIL Score is the most commonly used credit score across the lenders. Your payment history reflects the details like your Days Past Due (DPD) and the month and year of payment. DPD indicates how many days past the due date you have made that particular payment. If the number is 0, it is fine. If your payment is even a day or two late, it counts as negative. The later you pay, the more negative this is. If you own multiple credit cards, and there are some you don’t use but still own, you must be sure to know each one’s Terms and Conditions. Some cards have no fees while others charge a fee from the second year onwards. If this is the case and you don’t pay the fees probably because you are unaware of them, then the fees and interest keep accruing, and this reflects on your CIR. This also appears in the Accounts section of the CIBIL report. It shows the how much outstanding you have on any loans you have taken. So, if you took a car loan and have paid off most of it and only have say Rs. 50,000 left, then Rs. 50,000 will reflect here, for your car loan. It basically shows how much debt you still owe. The lower this figure, the better. Lenders will not feel comfortable lending to someone who has a high level of current loans outstanding already, while applying for a new one. If you have recently availed loans i.e. new credit facilities, then your ability to repay a new loan will be low. This is negative for your application. If you have recently applied for a few loans, this makes you look ‘credit hungry’. It makes it look like you are in urgent need of money. This also is negative for your application. Such factors influence the credit score you receive. “ How to check credit score for free? Where can I check credit score? How to get a credit score? If your mind is throwing up any such questions then, Cheer up! Because you have a reason to smile. Now you can easily access your free credit score! On the Home page, scroll down to the section where it’s mentioned – “click here to get your Free Annual CIBIL score and annual report”. This is a free credit annual report provided once a year. 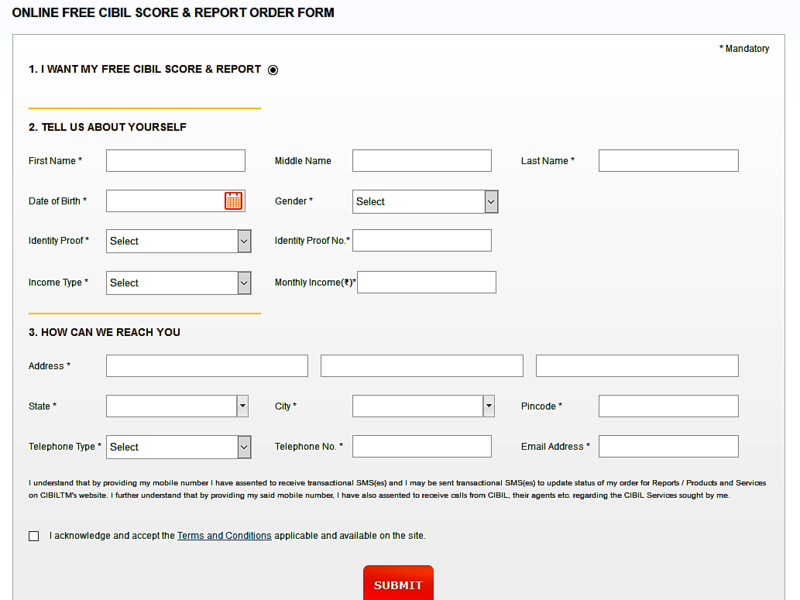 You can either apply for a free scorecard or a paid service. In the free online order form, you need to fill in your personal details such as name, date of birth, PAN details, address, etc. Please fill it carefully. Ensure that you submit the correct mailing address and details. As this is a free annual credit report from CIBIL, you can get access to only one free credit report a year. It will track all your past credit history and generate your credit score and report online. 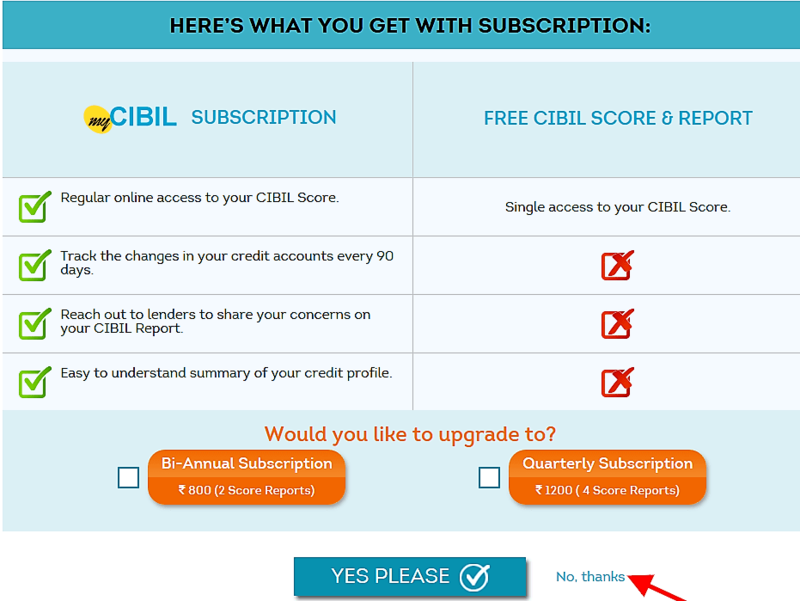 Once you fill in all the details a pop-up suggesting subscription to CIBIL will appear. The CIBIL subscription offers more benefits as compared to your free copy. While the Free report offers single access, the subscription offers you regular online access to the report, where you can track changes in the credit account more frequently. Opt for the premium subscription only if you are willing to pay. 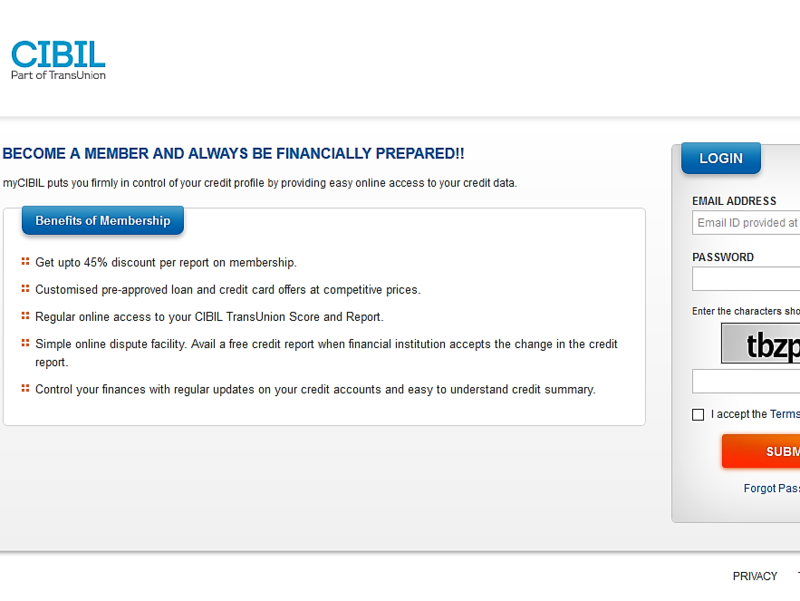 Alternatively, to receive your free CIBIL score and report, click on “No thanks” option and go ahead. Once all your details are submitted, you will receive a SMS about your credit score and a email will be sent to your registered email id, with a subject line ‘CIBIL – Access myCIBIL for your CIBIL report’. The mail carries the link to the mycibil login page and a one-time password. The mail will provide you with one-time password and a link that will direct you to myCIBIL login page. Type in the email id and one-time password you receive, confirm the captcha code, accept the terms and conditions, and click submit to view your credit score and report online. Be careful with the password as this is a one-time report. You can reset your password for future log-ins. Now you can view your credit score on the screen. The View Report tab will take you to your report section. Check the Account Information for detailed report and your credit history. The report contains your basic personal information, past payment history, overdue amounts if any, records of all the credit you have taken in the past, number of inquiries made by different lenders on you and so on. This information is useful to understand your credit worthiness. For example, if there is a high number of inquiries made by different lenders on you, it shows that you may have approached multiple lenders for loans, if those loans have been taken or not. However, this is not a good thing. As this is an online report, you will be unable to download or save this report. However, you can take a printout and keep it with you for future reference. 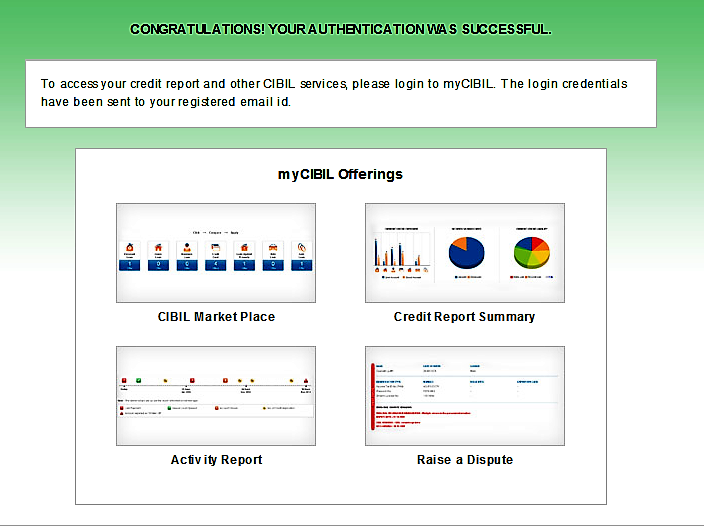 You can even revisit your CIBIL score and the Free report by logging in to your CIBIL account in the future. So, you see, it is very easy and simple to check free credit report. Your credit score is reflected in your credit report. 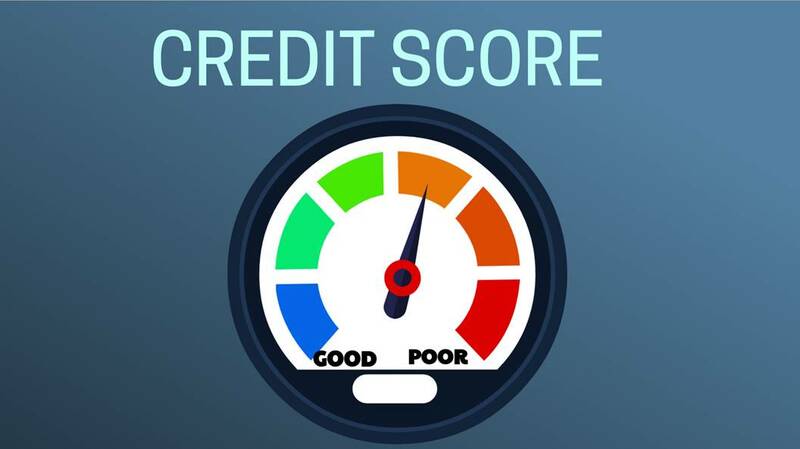 Credit report along with your score throws light on various factors about your credit behavior. 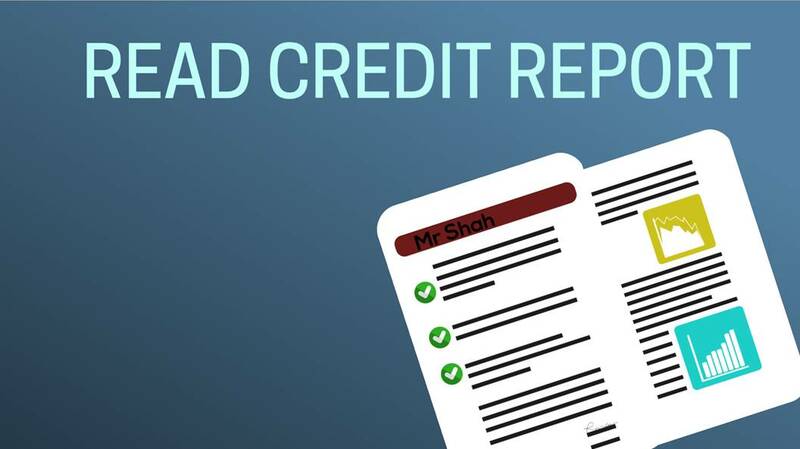 If your credit report is read correctly, it can help you take prudent corrective actions to improve your credit worthiness. This section exclusively talks about your credit score. The score ranges between 300 to 900 and the higher it is, the better your credibility. You might even get something termed as NA or NH; this means, either you have no credit history available or you are new to the credit system. This does puts you in a neutral place. And mind you, there’s no one-shot solution or ‘one size fits all’ approach. Life is dynamic, it does not move in a linear direction, and hence all aspects need to be interwoven well in your financial plan. 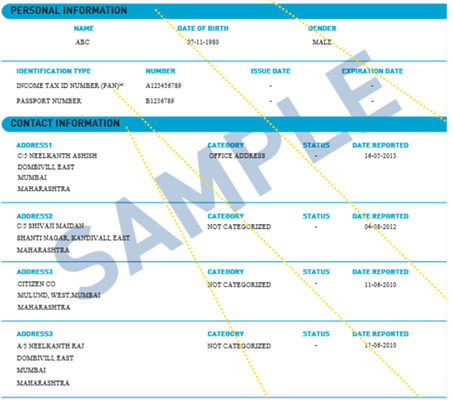 Next part of your report is your personal and contact information. This will include details such as your name, date of birth, passport, address, etc. You can have up to four addresses which could include permanent, temporary, and office addresses. 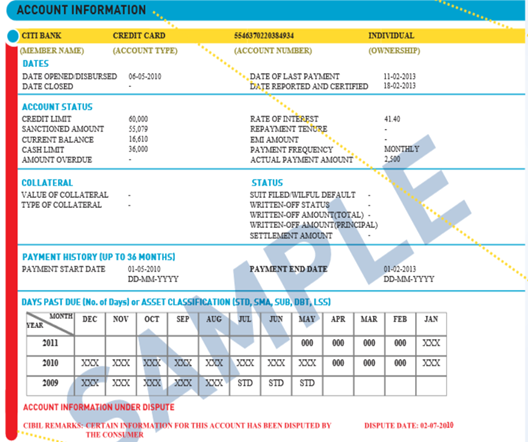 This section contains all the information of your occupation and income at the time of loan application. This matters to the lender and you; as usually lenders assess your earning potential based on the company you work for. For employees from listed and reputed companies, availing a loan is less of a hassle. This is the most important part of your credit report. It reflects all your loans and credit history. It includes the name of all your lenders, type of loan (such as home loan, personal loan etc.) availed, your loan account number, the mode of holding loan (joint or single), loan open date, last payment date, loan amount, current account balance, loan amount overdue (if any) and month-on-month record of your past payments upto 36 months. Your credit history, if any, will also be reflected here in this section. A dispute that needs to be addressed might be highlighted as a red band on the left-side of this section. You can resolve the issue by discussing it with your lender, and once this is sorted, you need to get a letter of clarification. This red band may or may not change even after the dispute is resolved; the decision thereto depends on the lender, and the credit bureau / agency cannot make amendments in this report on its own. This is the last section of your report and has all the information about the enquiries for various loans you’ve made so far. It provides details such as name of the lender, date of the application, the type of loan and the amount of loan required. The higher number of enquiries in a short period of time is indicative of your urgency to avail of loan(s), and this can negatively impact your credit score. This section allows you to add comments to your credit report. These remarks will be accessible to you and your lender for a year. Before we understand the importance of a Credit Score let us understand what a good credit score is. What is a good credit score? Or What is an ideal credit score? Well, CIBIL credit score ranges between 300 to 900. Usually, the score of 750 is considered as a good credit score. A core above 750 earns you the proud tag of ‘Excellent’. This in turn can help you negotiate for better loan terms. If you have a high credit score, your loan application might also become easier and loan processing becomes faster. However, if your score is below 300, then you are in a very bad light, in eyes of the lender. So, if you want a credit card or want to take a loan, you are probably going to face a difficult time. As the situation stands today, lenders will restrict you if your score is poor by possibly charging you a higher rate of interest on a loan, but sadly they are yet to reward those borrowers who have a high credit score. A poor credit score means you’ll be ineligible for many services. Primarily, if you wish to opt for a loan, banks / financial institutions will refuse or lower the maximum they would have been willing to lend you. 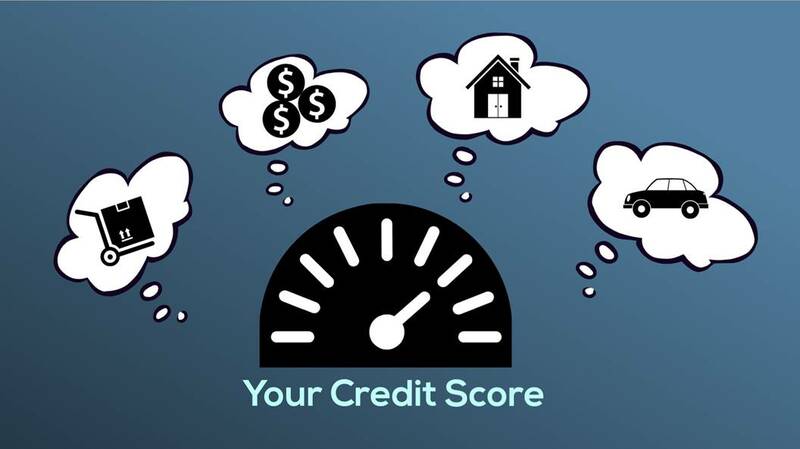 Your poor credit score might also result into a higher rate of interest along with the other hidden costs associated to loan. Your credit score plays a critical part in the loan granting process. Based on your credit score, a bank will decide how much interest to charge you on the loan you want to take. These reports contain your basic information, past payment history, overdue amounts if any, records of all the credit you have taken in the past, number of inquiries made on you by different lenders. All of this information is useful. For example, if you have made high number of inquiries with different lenders, it shows that you have approached multiple lenders for loans, whether those loans have been taken or not. This is not a good thing. It is also important to note that not all lenders have the same definition for a ‘good’ credit score. For example, a CIBIL score of 670 may be an adequate credit score for certain loan providers, but many will reject a loan applicant with this score. It is noteworthy that 80% of all new loans are sanctioned at credit scores above 750. The higher you score, the more favourably lenders will view your application. In a worst-case scenario, if you have fallen into a debt trap and don’t know how to handle it, your score is certainly suffering. Repaying your debt and emerging from the debt trap should be your first priority. Doing so will automatically improve your credit score. The first thing you can do is to always pay your bills on time. Keep your balances low and control your credit usage. For example, if you have a credit card with a limit of Rs. 5 lakhs, try to not use Rs. 4.90 lakhs credit. High credit usage can be viewed negatively by a loan provider. Avoid Credit Hungriness. If you have made multiple new loan applications, it reflects badly. Carefully monitor any co-signed and joints account you may have. If any payments are missed by your joint holder or co-signee, you are held equally liable and this can affect your credit application when you make it. Stretch within your means, and do not take long leap which can jeopardise the financial well-being of your family and land you into a debt trap. → How Do I Fix My Low Credit Score? Well, there’s no shortcut here. Those individuals who have a low credit score due to poor borrower behaviour in the past, can improve their credit scores by paying their dues on time, repaying any late pending dues, and ensuring that they do not default on any payments in the future. It will take time, but small sure steps will definitely raise the score. However, if your credit score is low not due to past indiscipline but due to an error on the part of a lending institution or on the part of CIBIL, do notify both the institution and CIBIL immediately. PersonalFN is of the view that the credit score, in a way, sheds light on your financial health, besides reflecting your credit behavior and worthiness. Hence, in the interest of you and your family's financial wellbeing, bite off only as much as you can chew. To put it simply, stretch within your means. A loan or a credit card must be taken only if you really require one and have the means, the ability to make timely repayments. If you simply opt for a loan or a credit card and are unable to repay all the dues on time, not only will this ruin your long-term financial wellbeing, but it will also have an impact on your credit score. If you start monitoring your credit scores, you would realise that your reluctance in repaying the loan or excess indebtedness affects your future prospects of getting loans faster. And you would become more particular about the repayment of your loans and overdrafts and would avoid applying for the excess credit. PersonalFN believes you should be careful while borrowing. Before you apply for the loan, you should always take into account the need and urgency for the loan. And of course, your repaying ability remains the most important consideration. PersonalFN discourages its readers and the investors from indulging in excess consumerism by opting for credit facilities. This is a sure way to enter a debt trap, and you should avoid it. If you often find it difficult to manage your finances on your own, or you think you need some expert advice, PersonalFN has a lot to offer—right from investing in debt funds to financial planning solutions. Remember: if you are a safe borrower, you would score well on your credit worthiness. So, before the bank or the lender surprises you with a negative feedback on your credit score, it is recommended to keep a regular track of it and maintain a healthy creditworthiness. If you like this Credit Score Guide, do share with your family and friends as well. You never know it might help someone to build a good credit score and start a healthy and debt-free life.